Bengaluru: Sensing trouble for the party in the upcoming Lok Sabha elections, former Prime Minister and JD(S) national president HD Deve Gowda has appointed a disgruntled Congress MLA as the chairman of the prestigious Bangalore Development Authority (BDA). Congress MLA ST Somashekar, who represents the Yeshwantpur constituency, had openly expressed displeasure over the JD(S)'s move to sideline him for the BDA post. However, now, Gowda has stepped in to appease him as he is aspiring to contest the Bengaluru North Lok Sabha seat. Gowda will vacate his Hassan seat for his grandson’s entry into politics. Prajwal Revanna, son of Karnataka PWD minister HD Revanna, will contest from Hassan. Bengaluru North constituency consists of Yeshwantpur and seven other Assembly segments. With Somashekar calling the shots in his constituency and being a strong Vokkaliga leader, Gowda sensed that his chances in Lok Sabha polls could be hampered if Somashekar turns rebel. According to sources, the Vokkaliga community members and supporters of Somashekar in Yeshwantpur and Byatrayanpura Assembly segments may back out during the MP elections and if the JD(S) gets the ticket it will a herculean task to take on BJP. The Congress-JD(S) Karnataka coalition government may continue its partnership for Lok Sabha polls too and come out with a seat-sharing formula. Somashekar said his appointment is not linked to Lok Sabha elections. "I do accept that there is a large presence of Vokkaliga voters. Whoever gets the tickets from either the Congress or JD(S), they will emerge victorious (in Bengaluru North). But my appointment with the political calculation by HD Deve Gowda is far from the truth. Our party general secretary KC Venu Gopal and JD(S) leaders will sit for discussions in the coming days," said Somashekar. Going a step ahead, Congress leader Kengal Renu said Gowda has openly hinted about contesting from Bengaluru North recently and the Congress has no issues with that. "The coalition was formed in a democratic atmosphere and the leaders are free to express their desires. Only after joint consultation, the decisions will be taken," said Renu. JD(S) leader and close confidante of Gowda, Mahalakshmipuram MLA K Gopalaiah expressed a sweeping victory to the former Prime Minister from Bengaluru North this time. The seat is held by Union minister DV Sadananda Gowda. "In Bengaluru North, the JD(S) will not only benefit from Somashekar but also from Byrathi brothers, Basavaraj and Suresh, who are popular in KR Puram and Hebbal. 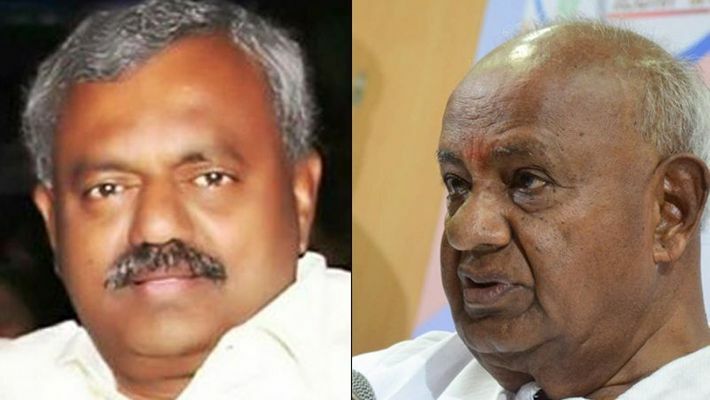 Both these constituencies are part of Bengaluru North and the duo will help the Congress-JD(S) coalition’s pick to defeat the BJP,” opined Gopalaiah. However, the BJP dubbed the appointment of Somashekar as a “dummy stunt” and said it was no need to term it as a “masterstroke” by Gowda. "Kumaraswamy is sitting in power at the mercy of the Congress. He will have to do what the Congress wants him to do," said S Prakash, Karnataka BJP spokesperson. Lok Sabha election: Hindu-Muslim candidate to take on BJP in Bengaluru Central?